As Thanksgiving is fast approaching, I’d like to share a few thoughts about gratitude. Today, more than ever, we are hearing the term discipleship used in Catholic circles, as we seek to breathe new life into the Church and advance the New Evangelization. It occurs to me that a prerequisite for discipleship is an attitude of gratitude—a virtue that leads us away from cynicism, pessimism, and indifference and toward hope, faith, and love (charity). I’m sure you’re familiar with the phrase “vicious circle,” which refers to circumstances in which the solution to one problem leads to a new problem (or to a new version of the old one). Those comedic greats the Three Stooges were masters at creating vicious circles. One of the most famous examples of this is when the boys pose as plumbers. Curly attempts to fix a leak in the shower by connecting a new pipe to the leaking pipe. Of course, the other end of the new pipe leaks, too—in response to which Curly continues to add more pipes until he has created a maze of pipes that trap him in the shower. Sometimes, our efforts in life can feel exactly like that, especially when the “pipes” we use to “fix” things are cynicism, pessimism, and indifference. Cynicism, pessimism, and indifference are all attitudes that help create a “vicious circle” that eventually imprisons us, just like Curly’s maze of pipes. 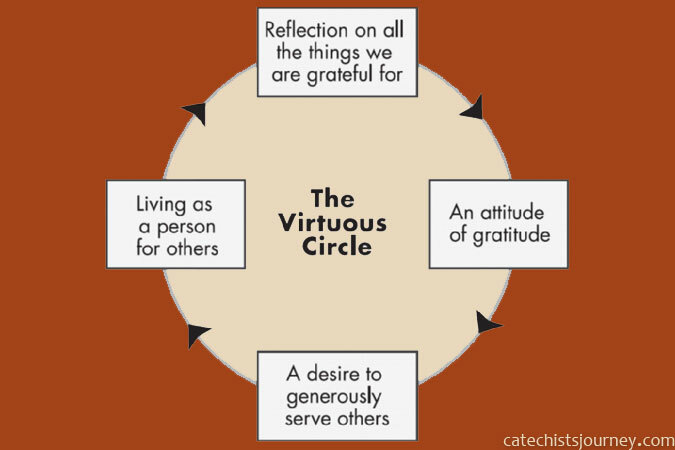 A “virtuous circle,” on the other hand, frees us to move beyond ourselves and to live as a person for others—as a disciple of Jesus Christ. Discipleship is not an authentic expression of faith unless it includes concerns for justice and human dignity—a concern that is fueled by an attitude of gratitude for the abundant graces God has provided for us and wants us to share. This Thanksgiving, allow your attitude of gratitude to fuel your discipleship—compelling you to be a person for others as you contribute to an ever-growing virtuous circle. 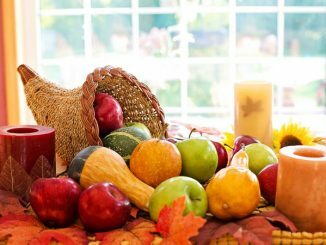 I need a short thanksgiving day prayer for this years celebration. Do you have one.